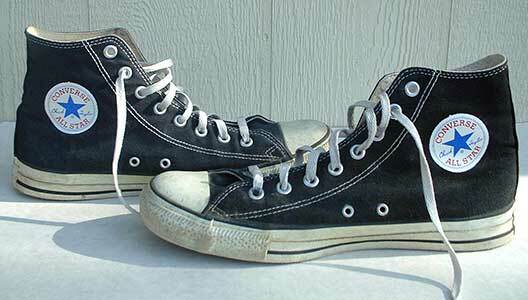 Black high top chucks have had a special meaning for many generations. I forsook them once. Flat betrayed them. Going off to James Madison Junior High, name brand shoes were a must. No Traxx brand from Kmart would do. No Thom McAn knock-off. So I got my blue Converse All-Star Chuck Taylor high tops. And then changed my mind. Goofy enough among the preppy K-Swiss and Adidas Stan Smiths the other kids wore, they were even goofier with off-brand, too-short (“Hey, you expecting a flood?”) blue jeans. As soon as I could, I ditched the Chuck Taylors for something white and leather. But that was before I learned the real value of chucks for my generation. They were a symbol of membership in the brotherhood of counterculture, a vulcanized heel with which to mash the penny- loafered toe of convention. They were a serious athletic shoe once, maybe even in my lifetime. I don't know when, but at some point in time they were rendered obsolete as an athletic shoe and relegated to the world of fashion. These days, no one would ever suspect someone wearing Chuck Taylors of necessarily being an athlete. When I returned to the temple of chuck, it was a punk rock thing. I wore black high-top ones, with the tongue flapping loose over the laces. Only goobers lace them all the way up. They were ugly, out of style on purpose, like combat boots you could skateboard in: the perfect compliment to thrift store flannel shirts, ugly plaid shorts or jeans rolled up too high. They were just the right shoes to wear when being quoted in this newspaper as saying, snottily, “I hate sports,” even though I was on the Patrick Henry High School soccer team at the time. Of course, chucks are at their worst brand new. They are infinitely cooler when the sharp edges have rounded off, and the black canvas has begun to fade to gray in spots. My own sharp edges have rounded off in the last few years, and my black hair has begun to gray. I'm 35, married, a father. I don't skateboard; I golf. But I still wear chucks, and I still roll my pants up a little too high. I like to think I'm still a little off-center, that I still have at least one foot in the counterculture. Or maybe I'm just pathetically hanging on to my rebellious past by one thin, fraying shoelace. “I don't have some,” she said, looking at her canvas shoes from Baby Gap. “Do you want some?” I asked. “Uh-huh,” she said.